Last spring we had someone show up to our house and they twisted off our wipers off our cars, bents out mailboxes, tore up our neighbor's mail, moved our retaining wall stone, and moved our trash can. My husband was the most edgy about the situation. I thought it was a one time thing. You can get this light on Amazon for $69.99, but it's on sale for $23.99. It has Prime shipping! It comes with instructions. I have to say that they were unclear. The instructions were written by someone from China. We found the broken English hard to understand. 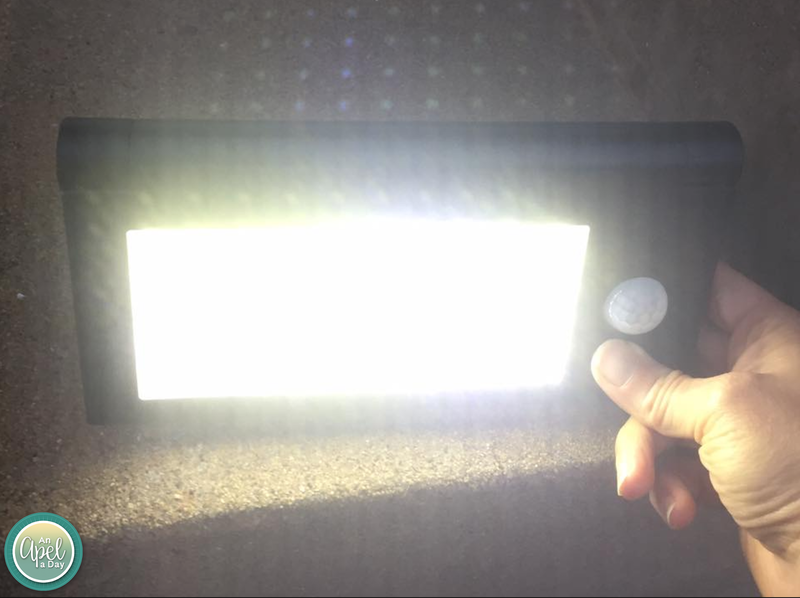 The light can be mounted easily! It has screws, and holes already in the mounting section. 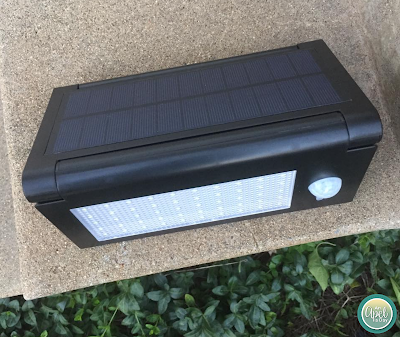 When it's mounted the solar plate is hit by the sun, and if the motion mode is one the light stays on if something is in front of it. There is a switch that can be hit for a different mode. High energy efficiency and smarter: Recharge by solar power. 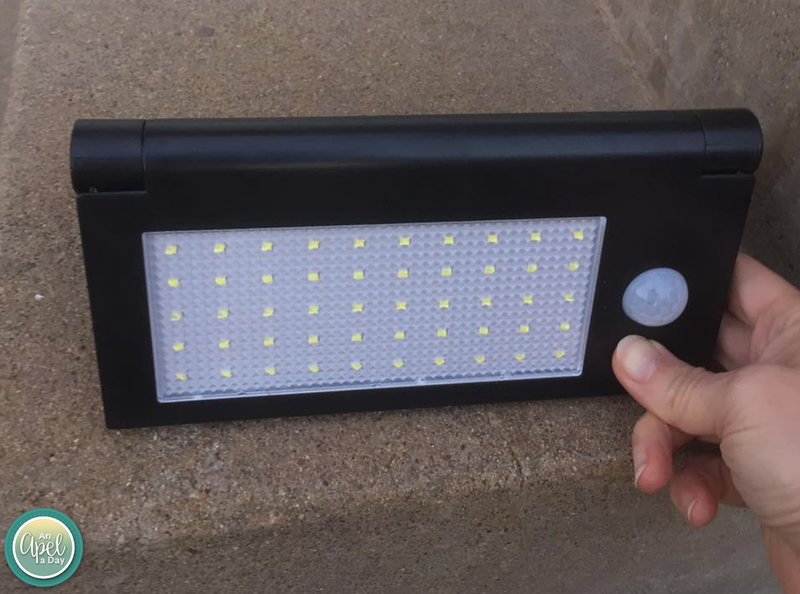 It can be used in a courtyard, residential road, park corridor and venues to provide safety lighting. We're installing it over our driveway. It's foldable, so certainly easy to store. Do you have a motion light around your house? We do have motion lights, but we also invested in a camera system too. We just feel more comfortable being able to see the house when we are away. We even caught the neighbor boys stealing some of our Easter decorations and when I pointed out the cameras and said I know it was you, he quickly apologized. Haven't had any issues since. Theresa - WOW! It's crazy what people will do! One of my old students called out a stranger on FB because they threw tons of trash in their dumpster. She had lots of mail with her name and address on it in there. She wants to fine her! Luckily Travis' work and my work let us throw big stuff away when it's close to time to dump their dumpsters. We've both asked. They pay for it regardless. We've a small motion light and camera on our front door.. just a small deterrence for anyone to try anything funny while we're not home and maybe even catch the culprit if something did happen.